TN Miller Remodeling is proud to have been selected for some industry awards in recent years. 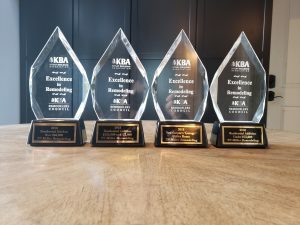 The Remodeling Excellence Awards are produced by the Homebuilders Association of Kitsap County and are bestowed for excellence in remodeling work, and are recognized as the highest award in the remodeling profession. TN Miller Remodeling was selected by Remodeling magazine as a winner of the 2008 Big50 Award. Remodeling editors, columnists, and industry leaders make the nominations each year. Following a lengthy evaluation process — which includes interviewing people at the nominated companies, and often interviewing their competitors, suppliers, and subcontractors — Remodeling’s editors select the 50 remodelers who exemplify the very best of the industry that year, and who have something to offer other remodelers in proven practices. Winners are selected in these categories: business savvy, fine design, industry impact, market wise, movers & shakers, niches, sales & marketing, and teamwork. Remodeling magazine, published by Hanley Wood, LLC, is the leading publication in the home improvement industry. Designed to address the specific concerns of residential remodeling pros, the magazine is both a business tool and an industry leader for the remodeling market.